The Circus House: If Tims Can do it so Can We! If Tims Can do it so Can We! This week Tim Hortons changed all the sizes of their hot drinks. Just like that, get used to it people the sizes you have always known are gone. And then I thought to myself if Tims can do it why can't we? When I was in High School I was always a size 10. Now that I am done having 5 kids and creeping ever closer to the big 4-0 I find myself a size 14. A number, a label, I am honestly not comfortable with. 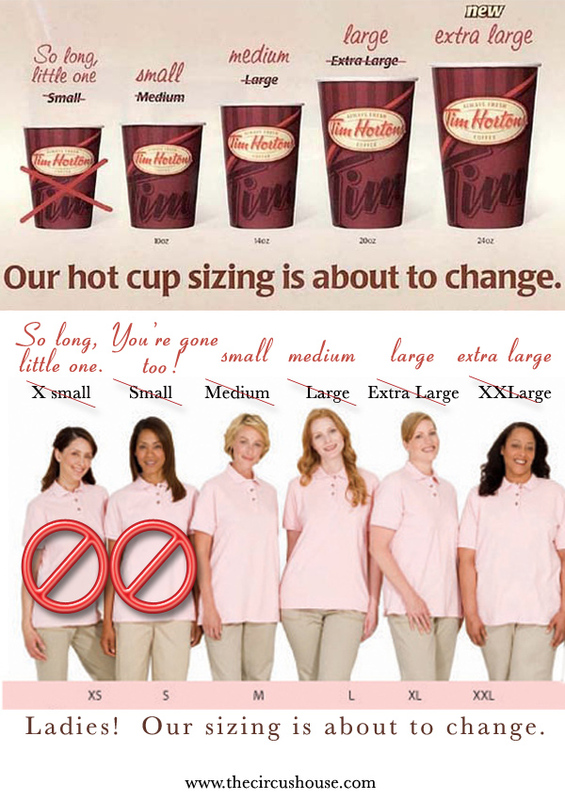 Thanks Tims for letting us know your size is whatever you say it is! Hahahaha. So funny Corla. Can I be a fun, fabulous or should I be a spunky spectacular? Thanks for the great morning start. See you when I get back. I love your thoughts here Corla! Too right! I can never understand why clothing manufacturers never thought this out. You look at a 'large' shirt these days and think, "OK, back in the day, this used to be a small." If they made the clothes fit bigger (ie: a large really is a large) then we ladies would buy more right? It's about refusing to go into that next larger size ~ haha! Good luck with WW. I am doing it on-line. Love it! I agree with you Corla. Since many people try to become the skinniest,clothing manufacturers tend to forget that they do have plus size customers. There should be always be XXL available shirt sizes.